Published title page and letterpress. Leonard Baskin. 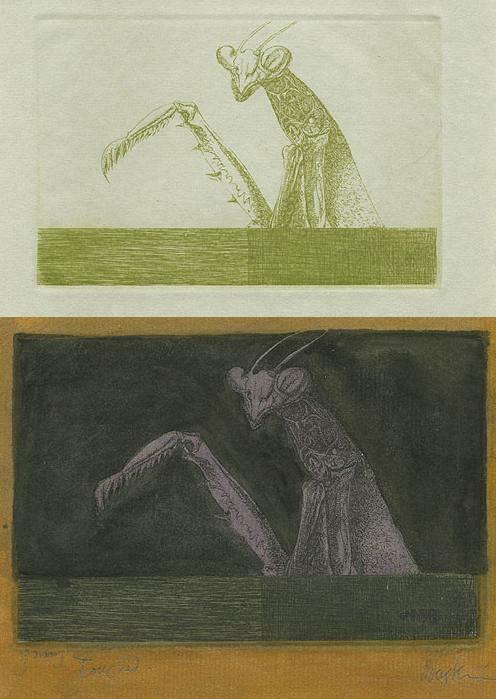 Color etchings of Moise Brisquette. 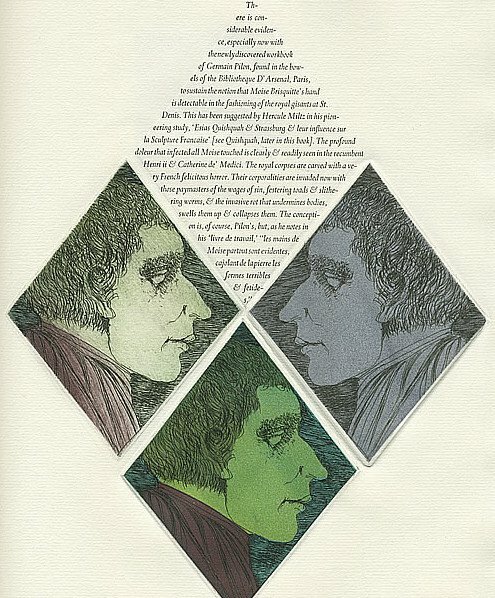 A Book of Etchings and Words. Gehenna Press, 1993.
cultural and human relics of that religion." Watercolor on heavy wove paper. 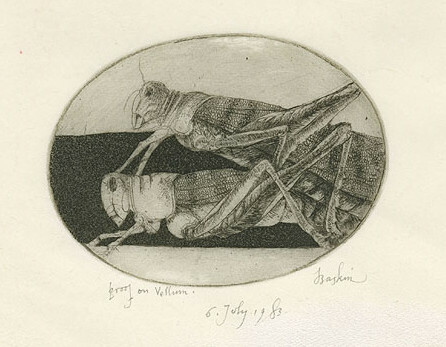 Color etching by Leonard Baskin. The Gehenna Press, 1999. 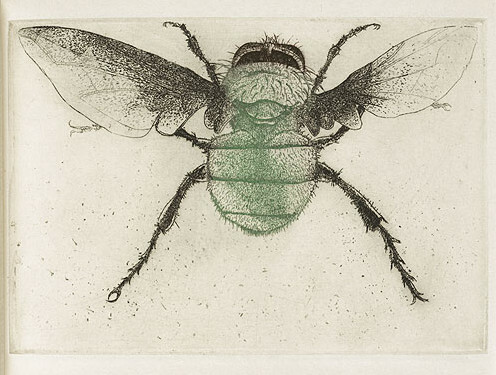 Diptera: a Book of Flies & Other Insects. The Gehenna Press, 1983. Color etching for A Book of Demons. 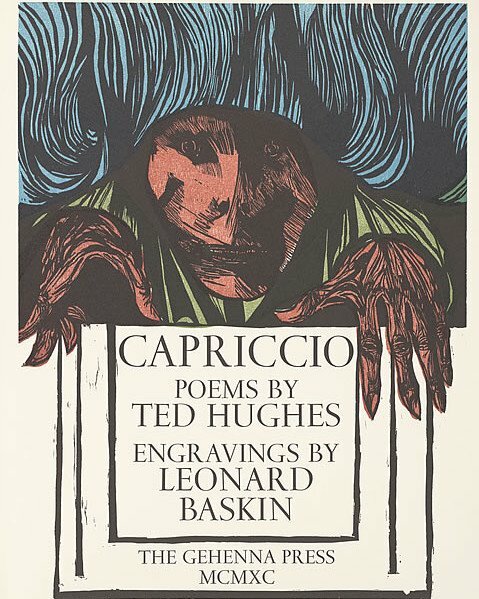 Leonard Baskin (1922-2000) was a graphic artist, sculptor, master printer, publisher and teacher and established the private printing house, Gehenna Press sometime between 1942 and 1953 (there are conflicting histories online). 'Gehenna' derives from a pun on Milton's Paradise Lost: "And black Gehenna call'd, the type of Hell." (Gehenna is 'hell' in hebrew). 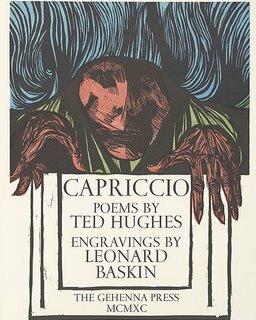 Baskin produced many of the prints for the more than 100 books that have been published in limited edition runs by Gehenna since it began. 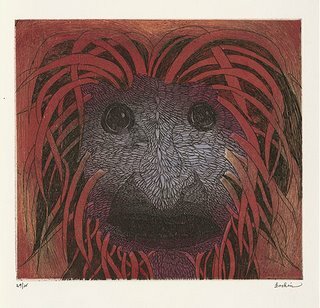 The above sampling seems a fair representation of the themes that run through Baskin's work: dark/nightmare images; natural history, people and more people and with a background and sometimes foreground vein from his Jewish heritage. 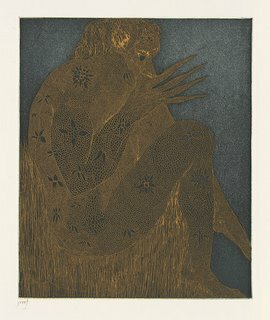 All the major art institutions and libraries of the world have works by Baskin who received countless awards for his books, prints and sculptures - which includes a bas relief (detail) for the FD Roosevelt Memorial and a bronze statue for the Michigan Holocaust Memorial. My understanding is that Gehenna Press is still operating in Massachusetts but they don't appear to have a devoted website. The images here come from Artifex: Leonard Baskin and the Gehenna Press, a great exhibition from a few years ago at Cornell University. R Michelson Galleries: Leonard Baskin - Sculpture, Watercolors and Fine Art Prints. 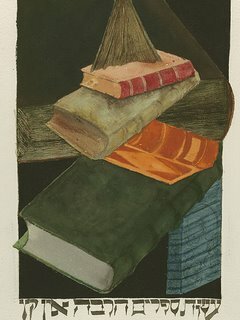 Davidson Gallery selection of artworks - horizontal scroll. Leonard Baskin in memoriam by Michael Kuch. Biography and selection of graphics at Wolman Prints.